Photo by Linda Stansberry Many contributors to a new Humboldt street paper have opted to write anonymously, and wanted to stay anonymous as they checked page proofs last week. "This is definitely going to be one of those 'you don't look homeless' days." The woman making this comment is about 50. With her thick dark hair in a bob, her blue windbreaker and wire-rimmed glasses, she could be a mom on her way to pick up her teenager from soccer practice. But she lives in her car, along with the two dogs she adopted before losing her home and job. She washed her hair under a cold water spigot in a public restroom two days ago. 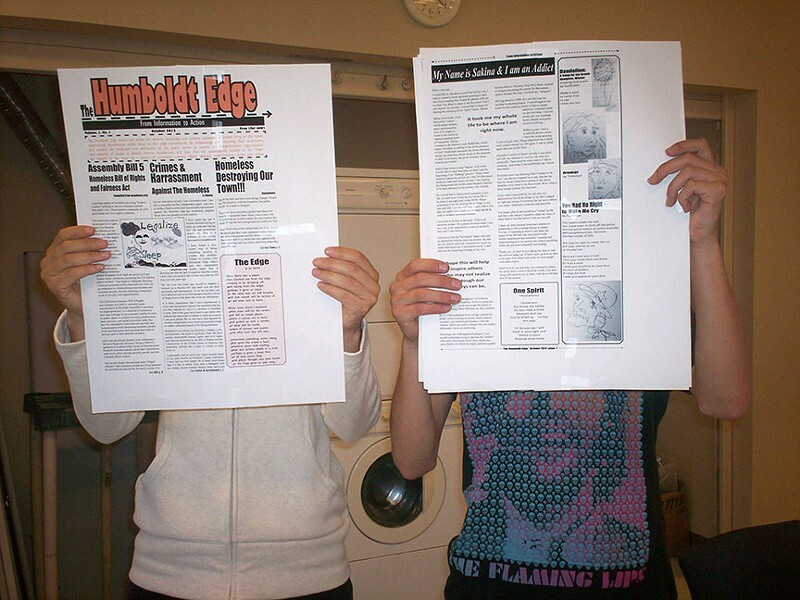 She is sitting with several other homeless people at a folding table in The Annex, a public resource center in Arcata, reviewing mockups of Humboldt County's newest newspaper: The Humboldt Edge, a street paper written and edited by those living below the poverty line. "What does a homeless person look like? Isn't that one of the questions we're trying to answer?" says Lorena Boswell, founder and editor, in response to the woman's comments. Boswell is a volunteer coordinator for HSU, and she organizes yearly trips for students to help the needy in cities such as San Francisco and Portland. This year, she and her students spent spring break in Sacramento, where Boswell met the editor of Homeward, a periodical written by houseless and low-income people. Bowell had been thinking about a Humboldt-based street paper for several years, and the meeting was a catalyst. Emotion colors her voice when she recalls talking with one of her students on the return trip. "I was ... talking about how I wanted to do this but I wasn't sure that I could, and he just turned to me and said, 'You can do this.'" Creating The Humboldt Edge involved collaboration and hard work. Some of Humboldt County's most marginalized residents overcame challenging circumstances to meet, deliberate, write, edit and authorize the paper's content. "It was an amazing process of getting people's voices," says Boswell. She went to community service organizations to find contributors who would vet every step of the process. The Edge's editorial team has been meeting every week since June. Many of the stories are published anonymously or under pen names. When reading the articles, it's easy to understand why. The writers speak of stigmatization, of mental illness, of harassment, of being pushed from town to town. Fear and anger are pervasive tones. Boswell says many of the homeless people she's met in Humboldt carry with them "wads of tickets" from the police, simply for "existing in a place when there's no place for them to be." 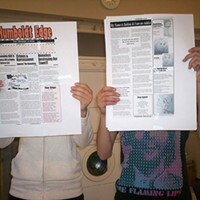 Some 2,000 copies of The Humboldt Edge's premier edition were printed on Friday. Originally it was only going to be in black and white, but the editorial board voted to spend a few extra dollars and add an eye-popping orange to the back and front pages. The paper's eight pages are filled with editorials, news, cartoons and poems. Copies were handed out at the Arcata Farmers Market, local coffee shops and community resource centers. Edge contributors at last week's editorial meeting talked about the challenges they had to overcome to get this far: no computer, no steady source of electricity, no place to sit down to write, drama at the shelter. Some contributors declined to help distribute the paper, saying they didn't want to out themselves as homeless. Street papers in some cities have a vendor program, which enlists homeless people to sell the papers for a fixed price and keep part of the profits. That could come in time for The Humboldt Edge, Boswell said, but for now, the paper is free and she is actively seeking businesses that would like to carry it. A $3,000 grant from the Jonathan M. Daniels Memorial Fellowship is underwriting the first few issues, and the Edge is looking for contributors for the next issue, which is planned for December. Copies dropped off at Fortuna's Apple Harvest Festival on Saturday were met with a lukewarm response. Few people seemed interested in picking up the paper, and the majority of those who did were already among the converted. "People need to get some unfiltered information about what's going on. We're all one incident away from being in the same place," said Anna Johnson of Carlotta, after taking a copy. Craig Mesman, who volunteers with the Riverlife Foundation charity in Fortuna, which feeds and clothes the needy as well as cleans up homeless camps, said he was happy to see the paper, and he echoed the hopes of many that this would help residents see homeless people not as a homogenous group, but as individuals. "The homeless are like the last disadvantaged group that everyone feels justified in taking an opinion against," he said.